Where the campaign will take place (galaxy, world, region etc)? What type of campaign will it be (grand cosmic story arc, adventure path, episodic, sandbox etc)? It will be set in the Havenscoast region of my home-brew world, Tolrendor. I’ve been re-developing this region from its original AD&D days, and nothing helps development like real adventures to run in it! It is intended to be a DnDNext playtest campaign. My aim is to keep the PC list fairly flexible, so multiple different character options can be explored. Also, I want to test how well the DnD Next will support a DM creating setting specific flavour, something that is quite important to me in a rule-set! By design, it will be episodic, as it is intended to run in parallel to my main Amber Tower campaign. In this particular case however, the Havenscoast is one of the regions of my world that is already the most extensively mapped, not only recently with some of the maps I’ve posted on the blog, but also with a large number of my original 19080s hand-drawn hex maps. 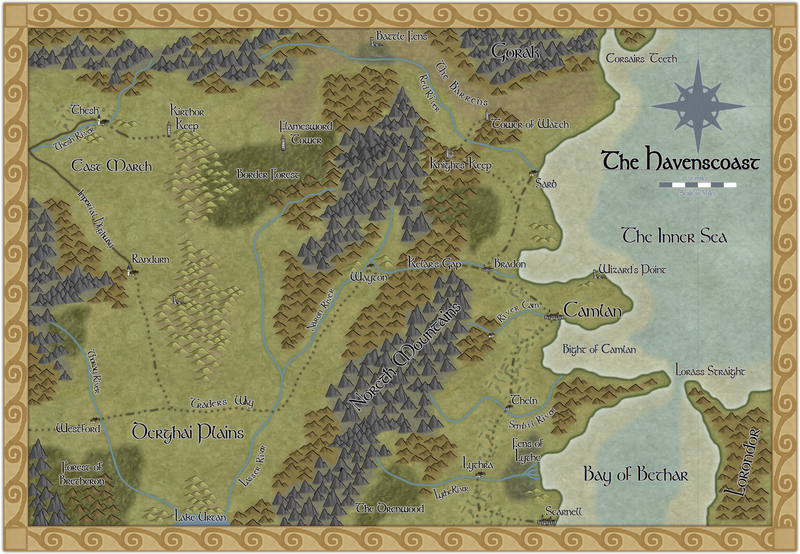 The bulk of this campaign will take place in the north-east region of the map, around Knight’s Keep and the Tower of Watch. I’m sure there’ll be more work to do here, but I’m off to a good start! Ok, so now I know a bit about what I’m going to run, and where, but it needs a lot of fleshing out before I can start to prep sessions in earnest! As I’ve recently discussed, I’ve been making heavy use of mind-mapping tools recently to help with this stage of the process. At this point, nothing is in or out, its just a matter of getting as many ideas jotted down as possible. Some of these may never be used, or may be picked up on later in the campaign, but they’re all useful! This document is a living document which continue to be updated throughout the life of the campaign; I am not the sort of GM who can come up with a 20-30 level story arc in advance! The adventures of the characters will shape how my ideas for the campaign develop, even if I have some narrative underpinning it all. This is where the process starts to become less about random ideas, and more about actual preparation i.e. I begin to actually write material for the campaign. It’s easy to get bogged down here, which can be fun of course, and a lot of GMs, myself included, love to detail rich histories and setting locations etc., but bear in mind that the more time you spend in this phase, the longer it will take to get to actually playing! Wolfgang Baur of Kobold Press made a great point in one of his essays on world-building (paraphrased): history is of no use to a campaign unless it impacts the adventurers’ current lives! 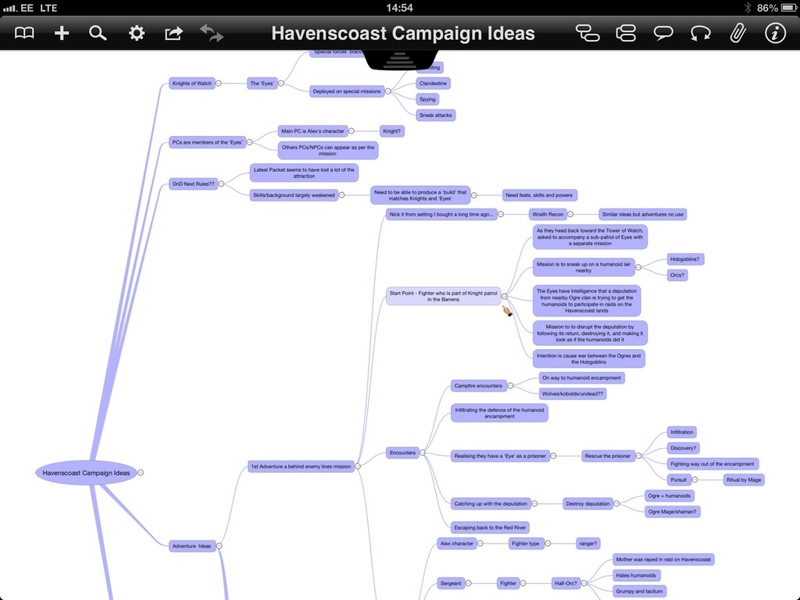 For this campaign, I’ve already written a short history of the Havenscoast, and an overview of the key locales. As the intention is that the characters are members (or at least associates) of the Knights of Watch, I need to put together some more detailed notes on this organisation, and hopefully some cool backgrounds and feats (in DnD Next parlance) that the players can use to add some setting flavour to their PCs. Armed with all the above, it’s time to turn my attention to the specific prep needed to get ready for the opening session or adventure of the campaign. I’ve been posting about this process a lot lately (e.g. here and here), so won’t go into it again. The goal is to really get a campaign off the ground with a bang, so the players immediately begin to invest in the setting, story and characters, so I try not to skimp on the preparation here! This entry was posted in Area Map B4: The Havenscoast, Havenscoast D&D Next campaign, Roleplaying with Kids, RPG Blog Carnival, The Amber Tower Campaign, The Havenscoast Project, Tolrendor Gazetter, World Building. Bookmark the permalink.